We haven't toured a lot of caves. Really just four major ones: South Dakota's Wind Cave, Arizona's Kartchner Caverns, The Oregon Caves, and New Mexico's Carlsbad Caverns. Because we're loyal to Alaska, we would also include El Capitan on Prince of Wales Island. 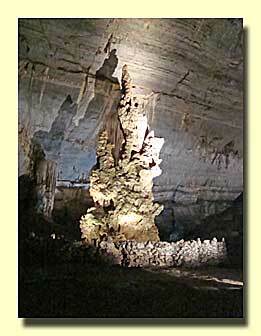 This week we bagged another - Guerro's Grutas de Cacahuamilpa near Taxco. In many ways it's the most impressive of them all! 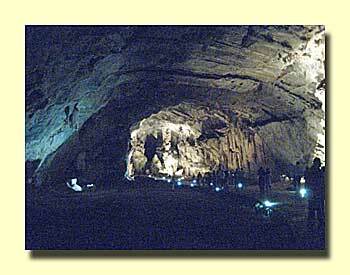 It's impressive because of the scale, the cavern rooms are huge. 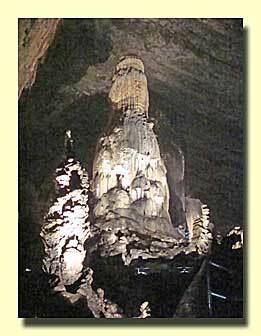 There's a good Wikipedia description of the caverns, click here. You can walk 2 km into the caverns. There's a good paved walkway all the way and it's fairly level although you descend a bit at the beginning and climb at the end. You must go with a guide. The guides only speak Spanish and stop and talk frequently, most of the time they are pointing out formations that look like various things: dogs, wolves, horses, birds, goats, cats, dragons, a tule tree, alligators, sweethearts, a bottle of champagne, Carlos Salinas, and many devils. 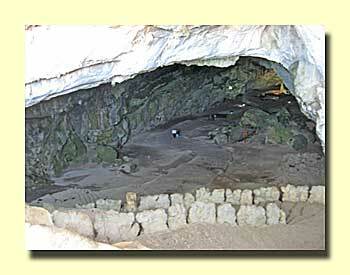 Then at the far end of the cave you are left to walk back on your own. Unfortunately, unless you meet another group most of the lights used to show the formations are off, you're left with just the path lights. They're fine for finding your way but don't let you see much in the way of sights. Here's where you pay, the girl's checking her email but is officially selling flashlights. Entrance on left. The deeper you go, the higher the ceiling gets. See the guy in the white shirt? We're nowhere near El Cielo but a recent email from a reader has got us thinking ahead. El Cielo is one of Mexico's best birding locations. El Cielo is in the state of Tamaulipas, up near the Texas border. It's between Ciudad Mante and Ciudad Victoria. 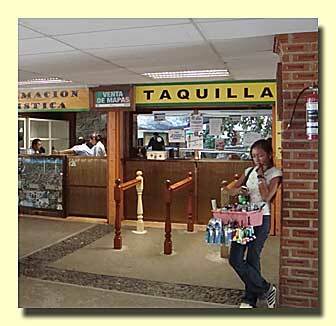 Both have campgrounds, see our Traveler's Guide to Mexican Camping for more information about that. 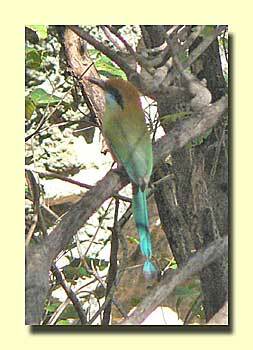 See also our Mexican birding pages. Here are some sites for information about El Cielo. Just wanted to let you know we went up to el Cielo today and it has really changed. Our last viist was ten years ago. They are building a new interpretive center about a mile beyond the end of the town. If is fabulous with walkways that go up into the trees. It is ramped so handicapped accessible and very very well done. It has viewing areas and they said a theater. We drove just beyond it and started walking up on a road that is 4 wheel drive only. The up part did not end so after about 2k we turned around. Slow walking is about two hours to the top and driving is about 45 minutes. Very rocky and bumpy for sure. There are trucks with seats in the back that will take people up, however, the rate is a group rate of 1000 pesos. There are also quads to rent but we did not ask about that. New options to stay but no camping areas that we saw.